I was talking with a friend I've never met yesterday by phone, and when I mentioned this site I've started he said, "Because you don't have enough to do, right?" It's true that I can always find something interesting to think about and do. But gosh I would rather have too much to be interested in than to be bored. In my Izannah study trips occasionally my camera turns to the right or left because there is something wonderful next to an Izannah doll. 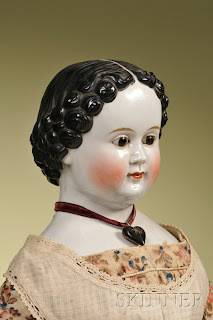 At the Skinner Richard Wright auction in October of 2009, I fell in love with this doll that was standing to the right of an Izannah Walker doll in the glass case. I was there to see the Izannahs, but in true distractible fashion my mind saw that red dress contrasting with the white Izannah dress and said, "Oooooh, pretty red fabric!" 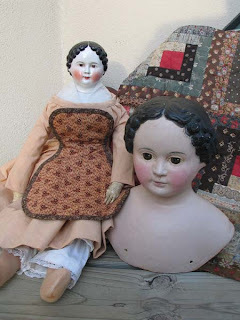 And then I looked up and saw this amazing lady doll. She was quite large. I wish I had taken many more pictures and had done a rough measurement of her. Isn't she amazing? She has a kind of expression that says, "I know all about you and you amuse me." 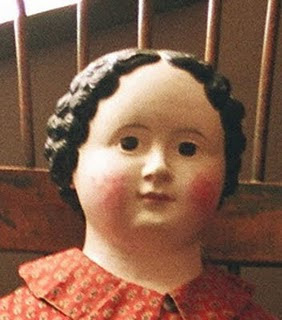 She is a cloth doll, but to me looks as if someone had spent quite a bit of time studying wooden dolls. Look closely at the neck construction. Where you see the wear in the cloth at the base it looks like there is a wooden square and perhaps a dowel connected. Or maybe it is a wooden finial or porch balustrade with a round top underneath the head? It would be fun to know, wouldn't it? She has a lovely curve to her arm. Amazing hands with individual fingers. 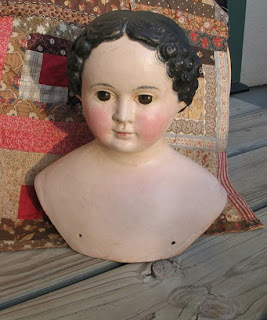 I'm guessing this doll dates to mid to late 19th century. If you have ideas, please leave a comment.